The dogs are coming back to help you de-stress before final exams! Save the date- April 28th from 11am to 3pm. We’ll have a variety of breeds from small dogs to big dogs. There’s something for every dog lover! 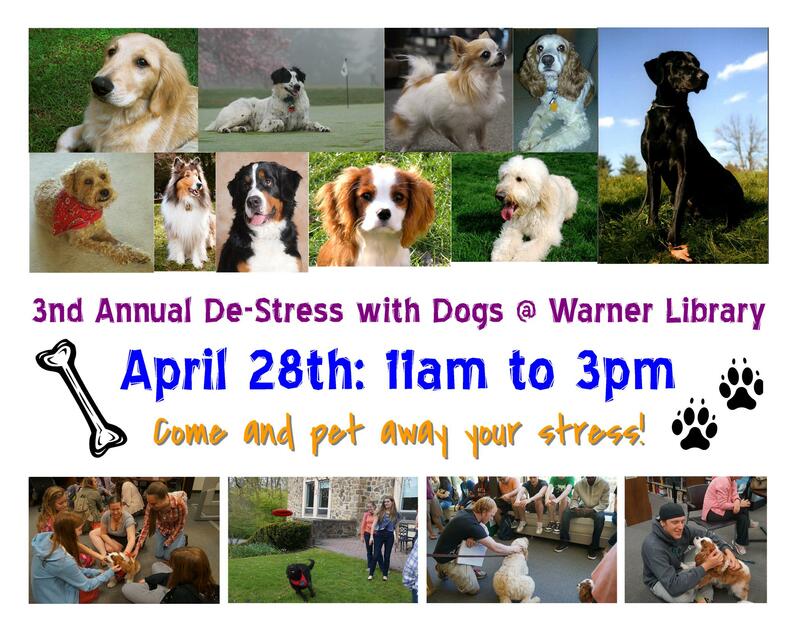 So if you are already feeling burned out at this point in the semester, Warner Library has just the stress-relieving remedy for you- dogs! Come pet away your stress. Stop by to throw a Frisbee (on the lawn of course) or just to sit and pet one of them and calm your frazzled nerves from the end-of-semester stress. These dogs are certified from Therapy Dogs International (TDI) (http://tdi-dog.org/) and come to us from their local chapter. TDI dogs visit senior facilities and hospitals (like CHOP) to provide stress-relief to everyone they meet. These owners and their dogs are very excited to be a part of our de-stressing day! This event is open to the entire Eastern community! So take some time to stop by, pet some lovable dogs and most importantly relieve some of that end-of-semester stress! ← It’s National Library Week!!!! !